Don’t settle for second best, you want a product that lasts and looks as good as it did the day it was installed, years later. Our team is here to respond to your enquiries quickly and efficiently. We offer a premium variety of choices of textures with artificial grass Perth for both front yards and backyards, as well as a range of other indoor and outdoor residential and commercial uses – sport surfaces perth, golf greens, playgrounds, patios, decks and pet areas. Imagine having lush green grass at your home or business year-round without the cost of water, fertilizers and lawn chemicals. If you would like enjoy having a beautiful, easy-care lawn that outshines ordinary artificial lawns, consider the advantage of artificial lawns and synthetic grass by Perth Artificial Grass PTY LTD. Call us Today. We have one of the lowest prices in Perth, if not the lowest. We take pride in our workmanship, and you can be rest assured we won’t leave until you’re happy. View our Artificial Grass Product Range here. Hock got referred to us by my sister who also had it installed for her house. His team really made sure we were happy with our new lawn 🙂 I would highly recommend anyone who is looking to get artificial grass done for their home. Jon and Mary have been a delight to deal with from start to finish. Clear communication throughout the whole process made things so much easier. Our new lawn makes our outdoor backyard a far more useable space than it ever has before. Thanks so much guys! Thank you Jon, Mary and Hock for your great customer service. After shopping around for a while, we decided to go with Metro Synthetic Turf. Jon offered me a great price and on installation day Hock and the boys arrived early and cleaned up after themselves. You could just tell they took pride in their work. If you're looking for a great product and fantastic service to match don't bother shopping around. I wish I found them first. Thanks guys! What a very professional company. Jon turned up for the quote and this guy know his stuff. He recommended the Winter Green for us and we absolutely love it. The installation team were efficient and clean. Hock and his team was such a pleasure to work with and worth every cent. Transformed my dead grass into an area we all love. Highly recommended! I absolutely love my backyard. Ken gave me a very fair quote, and was very honest. I just had other work completed in the backyard, and had some issues, so I was a bit smarter this time in hiring someone for this project. I got quotes from several other artificial grass companies, but none of them could come up with a vision for my backyard that interested me. Ken came in and blew me away with his ideas. I have no problem referring Ken. Just want to say thanks to the Metro Synthetic Team for all there help and support to complete my front lawn. Special thanks to Jon for the level of service he provided was superb. Why Choose Us For Artificial Grass in Perth ? At Perth Artificial Grass, we have made it our business to ensure that you can look forward to enjoying a well-manicured lawn all year round that requires very little in maintenance. If you are tired of spending your weekends mowing and spending so much on watering, seeding, fertilizer and other supplies; then synthetic grass is definitely for you. No one understands all things artificial grass better than our company. Perth Artificial Grass is an artificial turf supply and installation company based in Jandakot Perth, WA. We are a locally owned company and have been actively in operation for a number of years. Through the years, we have diligently built our brand in the market and will consistently hold to our continued drive to guarantee absolute customer satisfaction. Our service areas include all locations across Perth and its surrounding area. Perth Artificial Grass also works with clients from other states across Australia. At Perth Artificial Grass we offer the best of variety and a variety of the best. That is to say that we have a variety of premium quality products that our clients can choose from. The detail that goes into the manufacturing process of our products ensures that all our synthetic grass is perfectly suited for the Australian weather. What you get from our company is synthetic turf that is durable, a perfectly safe product and definitely a worthy investment that will last for long. As a company, we pride in a very strict manufacturer selection process. This process effectively eliminates any unscrupulous players who are non-compliant with industry set regulations and who churn out inferior products. Our specialist team always inspects the products to ascertain its quality. Additionally, we have an expertly trained and very seasoned team of fake grass consultants. Ours is a full-service supply and installation company, affording our clients the convenience of a one-stop shop. Our team has successfully completed numerous installations for residential, commercial and industrial clients over the years. If you are looking for the right synthetic turf product and an installation job done right, fake turf is definitely the company for you. Our turf installation experts have also prepared an easy-to-follow DIY installation guide for our clients who would wish to give synthetic turf installation a try. This is definitely a resource you can rely on as it is by experts, for the not-so-expert. As experts in the field, the team will appropriately respond to any feedback or follow up questions you may have on the same. With our artificial grass products, your imagination will surely be your only limitation as far as synthetic turf applications go. If you need fake grass for your lawn at home, perhaps the deck and patio or a pet run; we definitely have it. Synthetic turf for play areas and sports fields at school or in recreational centers? We surely have you covered. Are you an office building or any other commercial establishment looking to Zen up your working space with some calming green grass? We have you covered. As one of the leading expert in artificial grass in Perth, we appreciate the numerous applications of this very versatile product and keep an up-to-date inventory of the best grass types for the different applications. 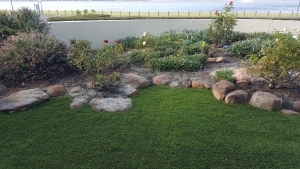 Perth Artificial Grass offers market competitive rates for both supply and installation services. The short and long term benefits of this investment are undisputable, making it an investment worth making. As mentioned, our products will have you bidding good riddance to mowing, watering, seeding, fertilizing, spreading pesticides and other activities that go into maintenance of natural turf. Perth Artificial Grass products are thoroughly inspected and have proved very safe for kids and adults. No lead, allergen-free and definitely no toxic emissions with our products. Our selection of artificial grass looks and feels as natural as the real thing. You don’t have to worry about your kids or pets getting hurt or sick as they play on the turf. Our grass has excellent drainage properties which makes it easy to clean when installed in a pet area. We supply top quality products that is long-lasting and will deliver excellent performance for years to come. For your own peace of mind, our products come with manufacturer-backed warranty. Similarly, we are an insured company, and our staff well covered. Perth Artificial Grass also guarantees any installation works undertaken by our team. Perth Artificial Grass is a recognizable brand and we pride in the large network of our residential, commercial and industrial clients. High-quality products, competitive pricing, efficient and reliable service delivery and excellent customer care and support have been at the heart of the numerous glowing reviews from our esteemed clients. At Perth Artificial Grass, we are very attentive to the specific needs of all our clients and extend courteously professional service to both the retail customer buying tens of square metres of artificial grass and the wholesale buyer who orders tens of thousands of our products. We have a colourful spread in the galleries of our product range and installation projects we have undertaken over the years. We invite you to look through the product page and hopefully the image and brief product description will help you make a better informed decision on the exact product you may wish to take home with you. Our showrooms and warehouses are also readily open to the public and you can request for a sample at any time. Right from helping you choose the right product for your intended use, supplying premier artificial grass, installing the turf to advising on proper care and maintenance,Perth Artificial Grass is definitely the company to partner with as you make the transition to synthetic grass. Get in touch today for any enquiries. We also provide a free quote and a no-obligation measure. Our installation process has been refined to ensure our clients have the best looking artificial grass on their street.